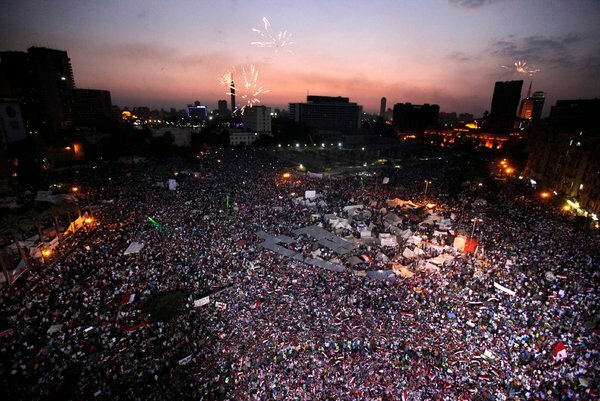 Morsi's War : Mohamed Morsi going down and taking Egypt with him? Egypt has erupted again and brutally. As I am typing this article, Morsi has been barred from leaving the country. As the world prepares itself for the Independence Day of United States of America, we see one of the oldest civilisations slowing going down the pit. Egypt as we all know is one of the ancient civilisations. Over the years from 1952 it was ruled with a iron hand first by Gamel Abdel Nasser. It was known as Nasser's Egypt during the time he ruled but it prospered under the iron grip of its Army and Nasser. After Nasser, Anwar Sadat came to power and shifted his allegiance from US to the USSR of cold war era. He had opted for USSR due to the continuous aid and back channel help US gave to Israel in the United Nations General Assembly. He rule extended for over a decade and through out his rule he spend maximum time fighting with Israel. In 1977, Israel and Egypt ended their differences and signed a peace pact. But Anwar's days were numbered. In 1981 he was assassinated by a military soldier. After Sadat, Hosni Mubarak came to power and rode it strong till 2011. And then it began, the Arab Spring. The revolution bugle had been sounded in neighbouring Tunisia and slowly and surely the revolution song had reached the ears of ordinary Egyptians who cared more about Egypt then Mubarak. They gathered at Tahrir Square and began their demonstrations which were rather peaceful as the Egyptian military took a semi neutral stance. Mubarak was toppled and people started celebrating the victory with marches and fireworks. But is was too soon to assume that everything was peaceful. Elections happened and Morsi from Islamic Brotherhood was elected with huge majority riding on the wave of change. But the first thing Morsi did was to expunge the military diktat of dissolving the law makers and making them ministers again. When the courts overruled his decree, he came out with another decree overruling the courts powers and orders. This started the revolution ball rolling again. El Baradei from secular Constitution Party tweeted that "Morsi today usurped all state powers & appointed himself Egypt's new pharaoh" People took to street again and protest were more fierce then the 2011 ones. A new power centre emerged. The Egyption Army which had maintained a slightly indifferent approach to Mubaraks regime took the Morsi decrees as a blot on its uniform. And now they are a logger heads. The Army has given Morsi until tonight to absolve himself of the Prime Ministership but Morsi is diffident. Such is the glue of power. The people who elected him want him out of office now but he seems to be worse then Mubarak. Where is he taking Egypt, to hell? As I have written above, a coup seems imminent in Egypt and hopefully the Army will hand over the reins of power to a democratically elected government like it did the last time. My only hope is that the next leader doesn't try to become a 'Pharoah' of Egypt. What is really needs is a good leadership at the helm for at least 15 years to make a smooth transition to true democracy. As and when the divisive politics will enter the Egyptian leadership there will be another Tahrir Square waiting to happen. PS Morsi has met his fate and Egypt stands liberated today, but is it really liberated?